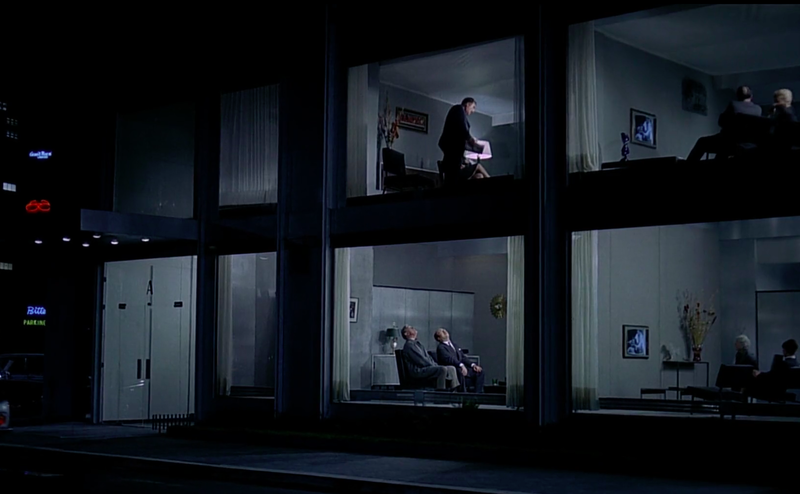 Jacques Tati often liked to say that the only real star of his film Playtime (1967) was the set itself. With his brilliant manipulation of its mise en scène, those words hold to be quite true. The minimally dialogued, loosely plot-based film is mainly structured around the changing of settings. As the movie goes on, an apparent pattern emerges among the scenery—it almost entirely consists of grey, pristine buildings, from the steely Orly Airport to the shiny new Royal Garden restaurant. Tati establishes this foundation in order to build up and play with the dichotomy of public and private space. Throughout the film, he juxtaposes these two ideas and questions the boundary that divides them. The only moment of private space we see in Playtime is when Monsieur Hulot’s acquaintance from the army invites him into his recently bought apartment. However, Tati takes this scene and challenges the extent to which the space could be deemed personal. First off, the design of the apartment complex remains consistent with the public buildings that we have previously seen—grid-like, silver, and clean-cut. In the below collage of the six main scenes in the movie, the apartment (middle picture of the top row) blends right in with the other buildings of this ultra-modern world. By making the aesthetics of families’ homes parallel that of public locations, the distinction between them becomes slightly blurred, for our expectations of how the two different spaces should look are challenged. Tati creates a disturbance in what we think we know—if we are not certain of how a private space should appear, do we even know how they function? As the scene unfolds, Tati continues to blur the line by showing each apartment in the complex watching TV. With each group partaking in the same form of entertainment, it appears as if they are all involved in a public activity while in their supposedly private space. A connection is established between the apartments by cutting to a zoomed-out shot revealing all four apartments in the complex. Our eyes are drawn to Hulot and his friend by the high-key lighting used on them contrasted with the remainder of the frame in dim lighting. We then witness Hulot and his friend looking up at the ceiling, as if they are looking right at the couple in the room above them. This first moment of play between the different apartments foreshadows the extended gag that is to come. Tati sets up the gag with two establishing shots: one angled so we can see the room with Hulot and his friend in full view, and another angled shot so we then get to see the apartment to the right of them. In doing this, it is pointed out to us that the televisions of both rooms share the same wall. The camera cuts again to focus on both rooms straight on, making them appear as if the two rooms are looking at each other. Tati then plays with this illusion, first having it look like the left room is watching the right room, with the reactions of the left timed perfectly so it seems as if they are responding to what is occurring in the room next door rather than the television. When the woman touches the man’s bruised nose, the people in the left room immediately yelp and cringe. The gag continues in this way, such as when the man on the right begins taking off his work clothes and the parents in the left room subsequently tell their daughter to leave the room. By blending the activities of the two rooms, Tati emphasizes the overlap in what each room is doing, and thus questions their use of private space. Other aspects of this scene further address the question, such as the choice of stationing the camera outside of the apartment complex. It is as if the viewer is respecting the privacy of the home, for we cannot hear the dialogue inside. Instead, we just overhear conversations of passersby since they are walking in a public area. And yet at the same time the privacy of the space is still uncertain, considering we can still see everything that is happening inside the rooms due to the big glass windows. Even an entire group of American tourists was able to gaze into the apartment as they passed by on their bus. 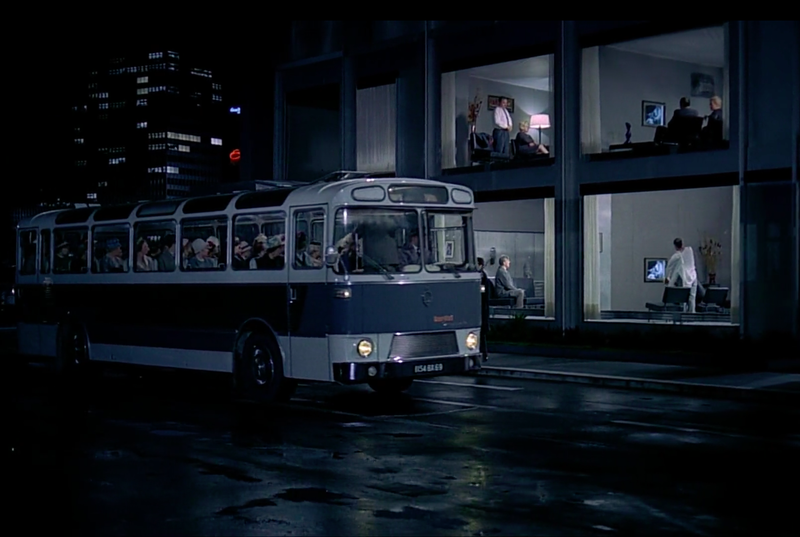 This scene in Playtime addressed how we define private space and whether it is all that different from the area of the public. The exploration of this concept continues into the scene of The Royal Garden restaurant. At this point, Tati begins to demonstrate various attempts of creating a private space within the public realm in an effort to draw attention to the arbitrariness of these distinctions. We see this being played out with the role of the doorman. Since the restaurant can only accept a certain amount of people, the doorman controls the flow of people and who is let in. However, this exclusivity is completely illusory—a physical barrier of glass is the only thing preventing the general public from entering the restaurant. When Hulot accidentally shatters this glass door, there is no longer any obligation to acknowledge the nonexistent boundary. This point is further emphasized when a man drunkenly walks straight through the “door” and into the restaurant, despite the doorman’s efforts at creating an illusion of the door still existing. The restaurant’s attempt at privatizing a public space ended up failing, for the line that divides the two realms is not easily maintainable since the line itself is fairly ambiguous. Another example of an endeavor of creating privacy in the public is when the American businessman, Mr. Schultz, tries to create a “VIP” area inside the restaurant by only allowing people with the chair imprint on their back into the space. Tati calls attention to the absurdity of the concept of a privatized VIP space in a public restaurant. He demonstrates this with Mr. Schultz’s humorous judgment on who makes the cut and who does not. The silly requirement that Mr. Schultz enforces pokes fun at exclusivity and what defines it. The absurdity is further exaggerated due to his chosen place, which is definitely not a VIP area. It merely consists of a corner of the restaurant that was deconstructed by the rowdy dinner guests. The blown fuse is the finishing touch for this exclusive space of the elite. Playtime puts to question the definitions of public and private, and how they restrict the two from blending into one another. Tati challenges these restrictions by organizing humorous situations and playing around with space—both the concept of it and its physical makeup. Through this film, he teases people’s attempts at imposing distinctions between public and private spaces while at the same time distorting those divisions. 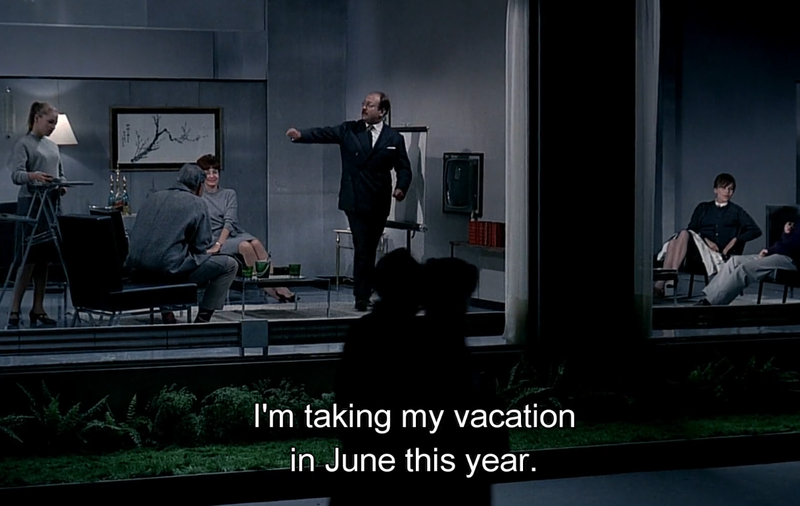 Jacques Tati pulls off making a joke of this idea while he playing around with innumerable gags in this delightfully whimsical and charming film.